With the re-release of U2's fourth album, The Unforgettable Fire, the group has decided to share rarely seen before seen video footage with their fans. The video showcases frontman Bono speaking on the recording process of the breakthrough album and flashes back to some of the most historical songs ever written. 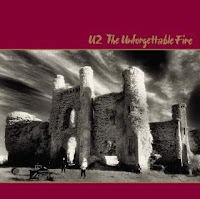 The special edition release of The Unforgettable Fire marks 25 years since the album's original release in October 1984. Recorded at Slane Castle, Ireland, The Unforgettable Fire was the first U2 album to be produced by Brian Eno and Danny Lanois, and spawned two top 10 UK singles - "Pride (In The Name Of Love)" and "The Unforgettable Fire." The Unforgettable Fire is available now in four different formats, with deluxe editions that feature two previously unheard tracks from the Slane Castle sessions: "Yoshino Blossom", and "Disappearing Act" as well as a limited edition Super Deluxe package which includes a DVD featuring music videos, a documentary and unreleased live footage from the Amnesty International Conspiracy of Hope Tour in 1986. U2's The Edge, directed the remastering from the original audio tapes, this release is a must have for any U2. Make sure to check out the video footage in its entirety and visit www.u2.com for more information and for the band's most recent tour dates.